In an attempt to better serve our customers Standing Bear's Trading Post conducts all ordering via phone, e-mail and at our store in Reseda, CA. Items listed on our website are items we can get from these suppliers and may not be in stock at our store at all times. all in line with your interest in leatherwork. 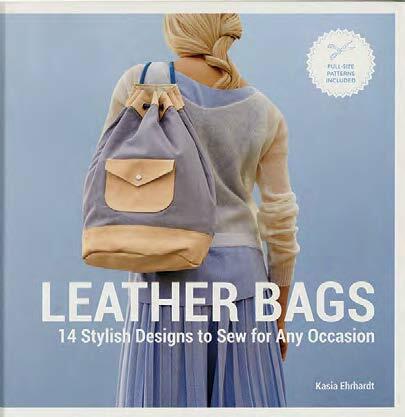 The range of this magazine is from novice to professional leather-worker. Buy it here at the shop or subscribe via the Leather Crafters and Saddlers Journal direct and tell them Standing Bear's Trading Post sent you! Used by institutions as the stu dent textbook. and Kay Laier. 30 pages. dyeing techniques and helpful hints. Learn to braid buttons, belts, hatbands, quirts and more. instructions and a wealth of fascinating information. Al Stohlman’s introduction to the art of silhouette and inverted carving. Learn the fundamentals of rough-out carving. 48 pages. belts and more. 48 pages. eight top leathercrafters. 36 pages. so you can make a holster to fit any pistol. 32 pages. 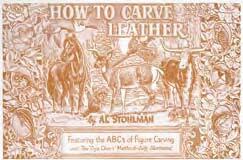 introduction to leathercraft carving,. lacing , dyeing, leather fabrication, cutting leather, setting snaps, using chisels, special tips and the proper use of selected hand tools. In addition, three projects with complete patterns and instructions are included. The projects are a key case, billfold and handbag. 160 pages. 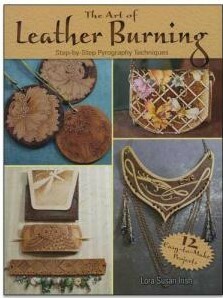 The Leathercrafting book covers a wide variety of subjects including the history of leather, leather definitions, preparing your leather for stamping, proper use of the swivel knife and how to use leather stamping/tooling stamps. It also shows you the proper way to use leather dyes and stains, as well as lacing and stitching techniques. An excellent book for taking a beginner from start to finish. 58 pages. 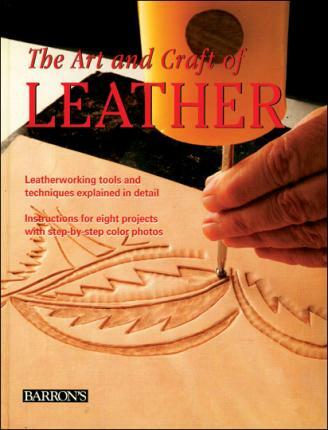 Learn the basics of leathercraft with this book. Learn to use a swivel knife, stamp, dye,finish, lace, handstitch, skive, gouge, set snaps and more. 30 pages. hole punching and needle threading. 14 different designs to personalize leather projects. Features 1", 1-1/4", 1-1/2" and 2" size alphabets. 48 pages. 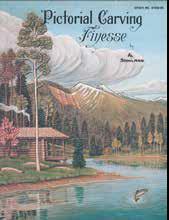 This book features some of Al Stohlman’s imaginative and creative designs. It’s the perfect book for beginners and experts alike. Includes 30 projects. 80 pages. This unique manual was created especially for beginners and intermediates. Shows tools and techniques for tooling leather. Learn to use swivel knives, stamping tools and more. 22 pages. Make small cases for knives, cameras and more. Make briefcases, attaché cases, boot cases and more. Make gun and guitar cases, golf bags and more. 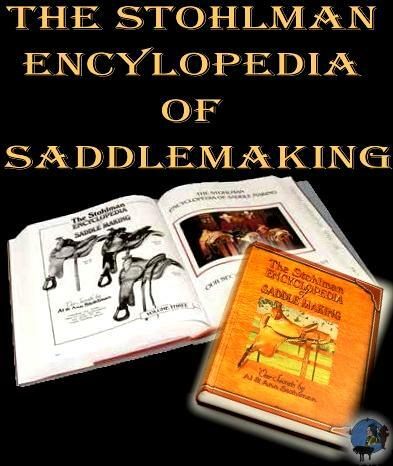 The Stohlman Encyclopedia of Saddle Making is the most complete set of instructions on saddle making ever published. Begun in 1988, this is the last significant work completed by Al before his death in 1998. Al makes it possible for the novice leather craftsman to tackle the ultimate leather project. If you ever plan to build a saddle, this is a resource you will want to have access to. Learn about cross-dyeing, shading, staining and brushing techniques. Includes dye mixing charts. Written by Al Stohlman. 54 pages. Al Stohlman shows you timeless stitching techniques with valuable information on tools and materials needed to get started. 72 pages. 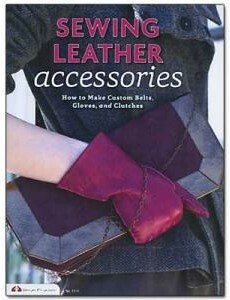 A helpful manual for sewing leather garments and accessories. 14 pages. Various buckstitching techniques for handbags, buckles, billfolds and more. 48 pages. 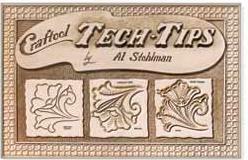 Stohlman Step By Step Peter Main teaches how to carve oak leaves, acorns, wild roses and other flowers, as well as many styles of leaves and scrolls by Al Stohlman's methods. 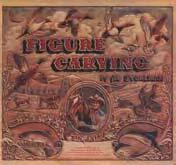 The best book available to teach you the beauty of pictorial carving. Learn to carve scenery that looks realistic, including grass, rocks, trees, mountains, clouds, smoke, fire, water and more. Explains perspective and color dyeing. Written by Al Stohlman. 72 pages. 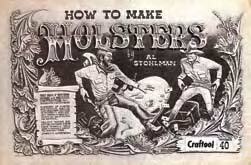 Al Stohlman explains in text and carved examples how to do everything from eyelashes to raindrops. Hundreds of animals are shown with explanations on how to carve skin textures, hair and fur types, and almost anything else you might attempt. 132 pages. Set of full-size tracing patterns designed to accompany Pictorial Carving Finesse and Figure Carving Finesse. Contains 52 pattern sheets. 8 pages. knives, punches, chisels, edgers and many other leathercraft tools. 98 pages. 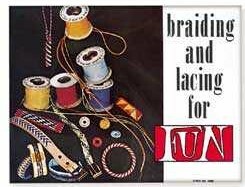 This book, from the whipmaker of the Indiana Jones movies, is geared toward beginners but also makes a great addition to any experienced braider’s library. Includes instructions and photographs for seven projects that become more challenging with each lesson. The techniques are from Australian whipmaking shops, which are recognized for their high-quality work. 148 pages. 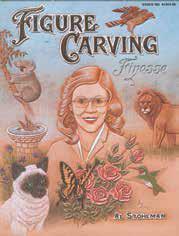 Shows how to carve animals, birds, flowers and scenery. Step-by-step illustrations for using contour bevelers, modeling tools and other figure and pictorial carving tools. Written by Al Stohlman. 16 pages. Includes 20 great patterns for billfolds and alphabet patterns for personalizing projects. 36 pages. 17 wallet designs. Includes tracing and photocarve patterns. 36 pages. 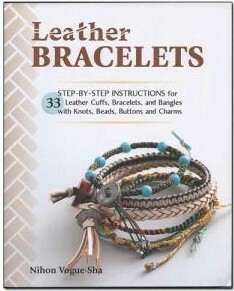 An easy-to-follow instruction book on braiding and lacing. Includes over 40 projects. 28 pages. twists, knots, braids, corners, animals and finials. 96 pages. How to make custom belts, gloves and clutches. Written by Elean "Birdy Teacher" Ho. Patterns and instructions to create classic bags and accessories with a modern flair. 112 pages. Written by Cat Horn. Clear step-by-step instructions for 30 cool bracelets, pendants and more. 128 pages. 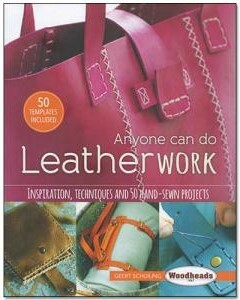 Over 20 classic and contemporary leatherwork projects for both the beginner and advanced leatherworker. Each technique is carefully explained with step-by-step instructions to get you started. 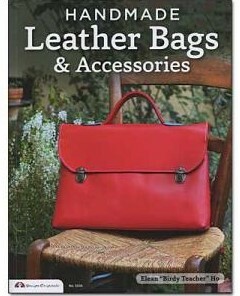 Includes everything you need to bring handcrafted leather to your wardrobe and home. 160 pages. 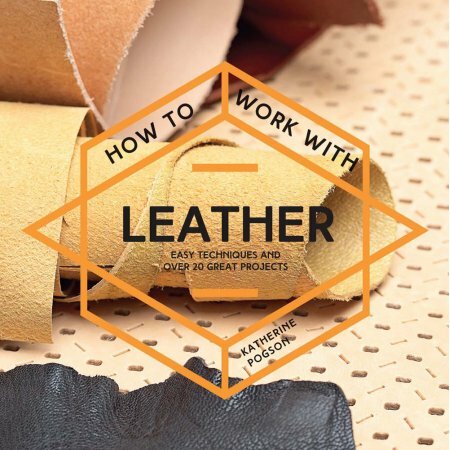 leather designer Geert Schuiling walks readers through the essentials with photos and explanations of necessary tools, types and cuts of leathers and the beginning techniques of leathercrafting. Forty-four patterns are included so readers can create their own templates for projects ranging from simple coasters and trays to wallets and purses. 160 pages. 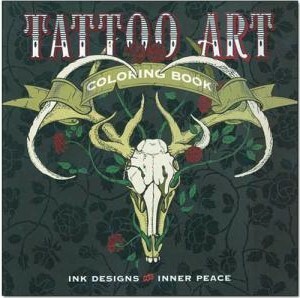 Contains 90 beautifully executed tattoo-inspired designs. From traditional subjects, such as skulls and flowers, to Japanese imagery such as koi and dragons. The designs are the perfect inspiration for your next leather carving project. 96 pages. Learn how to use a leather burning tool with confidence. Legendary wood and leathercrafter Lora Susan Irish focuses solely on leather pyrography techniques and projects. 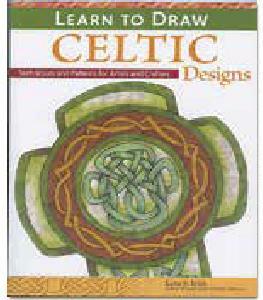 Inside you will find step-by-step directions with full-color photographs to help you learn this beautiful craft. 122 pages. 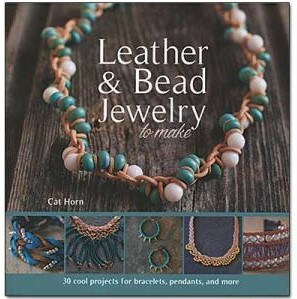 Make the most of one of today’s hottest jewelry trends with this book. Inside you will find 33 beautiful beaded, knotted and braided accessories that would be at home on the shelves of the most stylish designer boutiques. 112 pages. Learn the secrets behind bold designs with a modern edge. LeatherCrafted teaches you how to cut, punch, sew and rivet leather into one-of-a-kind accessories. Start small with a simple keychain, then build up to a belt, wallet, phone case, messenger bag and more. 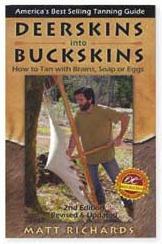 Learn how to recreate authentic Indian handcrafts such as moccasins, lacings, purse nets, wigwams, snakeskin belts and so much more with this amazing book. 138 pages. This Japanese-language how-to book includes step-by-step photos so that readers from every country can follow the instructions – even if they can’t read Japanese. The book includes removable templates for all 11 projects, including keychains, wallets, gift boxes and purses. 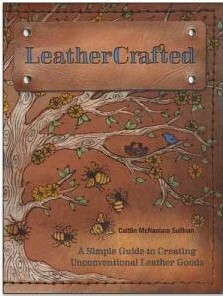 Leathercrafters of all experience levels will value the author’s presentation of history, techniques and information. 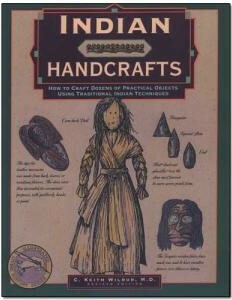 This well-illustrated book explains the role leathercraft has played through history and discusses various tanning methods. Nontraditional ideas fill this book with eight different projects. 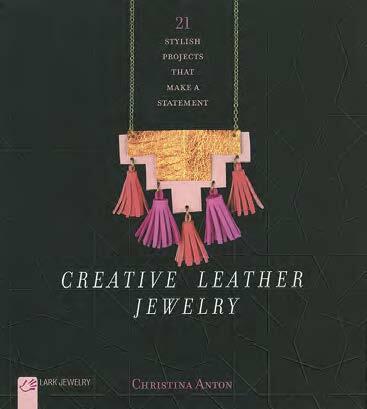 Creative Leather Jewelry By Christina Anton. Turn small pieces of leather into colorful geometric earrings, necklaces and bracelets. Simple instructions are illustrated to make them easy to follow. Author explains all tools, leather, materials and techniques needed to complete 21 projects. 119 pages. Protect your beautiful hand-forged knives or keep your favorite piece of cutlery close for daily use with a leather sheath. From basic leatherworking techniques to the professional-level tips you need to make your project its best, these how-to books will walk you through the steps to produce your own fixed-blade knife sheath. Each step, from the first sketch to the final leather treatment, is explained comprehensibly through words and high-quality images. Choose from four different designs, each presented in detail, including a sheath with folded belt loop, a scabbard with leather lining and riveted belt loop, a sheath with safety strap and attached belt loop and a scabbard with belt clip. This book will walk you through the steps to produce two top-quality welted sheath designs: a welted sheath with attached belt loop and one with belt clip and protective strap. 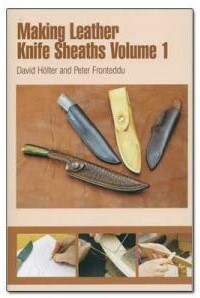 This book also serves as a manual for developing other sheaths of your own design. 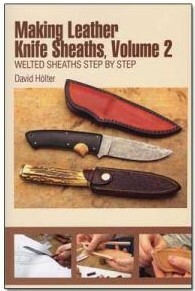 This book shows how a welted leather sheath for a fixed blade is designed and constructed. 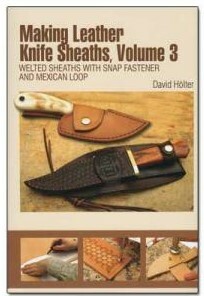 This volume teaches a welted sheath design with both a separate Mexican loop and a snap fastener. Western and traditional styles in adult sizes small, medium and large. Child’s traditional style in small, medium, large and X-large. Make your own pair of chaps for ranch, rodeo or biking. Patterns include batwing, shotgun and chinks. Full size patterns with instructions on breast collars, halters, bridles, head stalls and more. Patterns for a full compound bow case, arm and finger guards and five quiver styles. Detailed instructions included. Three distinctly different case patterns for you to create and customize. Full size patterns and detailed instructions for two great styles of saddlebags and horn bags. Step-by-step instructions for custom holsters, shoulder holster, gun belts and pistol caddy. Four fantastic designs. The Classic, Downtowner, Mustang and Rodeo. Detailed instructions are included. Leathercraft pattern to create authentically styled knee high boots. Men’s sizes 5 to 12. Patterns for twenty-five holsters and five gun belts from F.O. Baird. How-to instructions for Spanish Round Lacing, alphabets and pattern making. semi-automatic pistols, using detailed instructions and full-size patterns. Patterns and instructions for two batwing, three shotgun and a child’s shotgun style chap. Full-size patterns. Makes sizes small, medium and large. 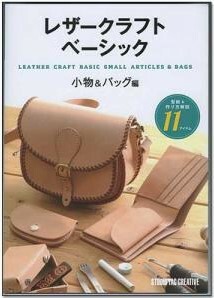 Patterns and instructions for three styles of leather saddle bags, a sissy bar bag and a tool pouch. This pack features fullsize cutting patterns and instructions for two styles. Makes Fringed Boot in men’s sizes 4 to 12, women’s 5 to 13. Makes Scout Moc in men’s sizes 5 to 12, women’s sizes 4 to 13. Full-sized patterns and instructions for comfortable, rugged, knee-high lace-up boots. For men’s sizes 5 to 13 and women’s sizes 6 to 14.